I made 64 mini meatballs and they were super delicious! Makes 6 to 8 servings. In a large bowl, whisk the eggs with the milk. Then stir in the Panko, garlic, cilantro, oregano, basil and grated cheese, 2 teaspoons salt and 1/2 teaspoon pepper and optional spices. Add the turkey and combine using your hands and fingers. 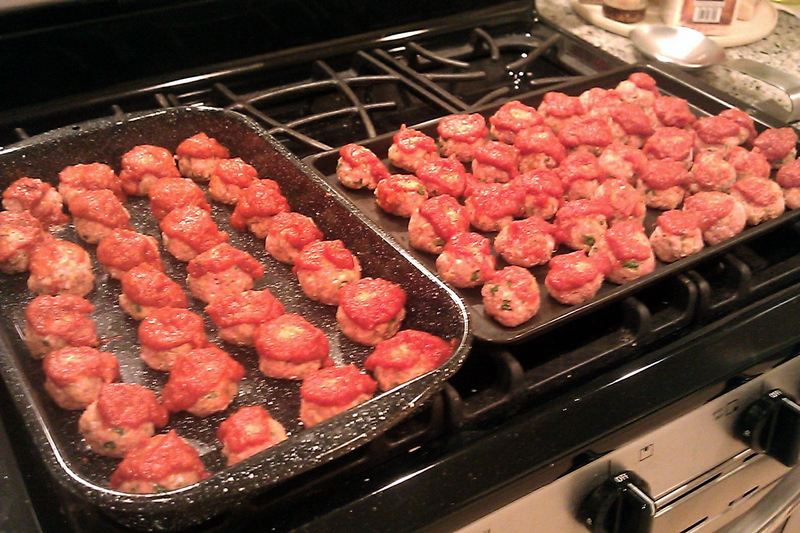 Form the mixture into mini meatballs about 1 1/2-inch diameter. I topped the meatballs with some pasta sauce which took a little over half a jar of sauce. Suggestion: pour out entire pasta sauce into a bowl and dip the meatballs into the sauce to completely coat your meatballs. Bake on center rack for 45 to 50 minutes. Meanwhile, bring a pot of water to a boil and cook your pasta according to the package instructions. 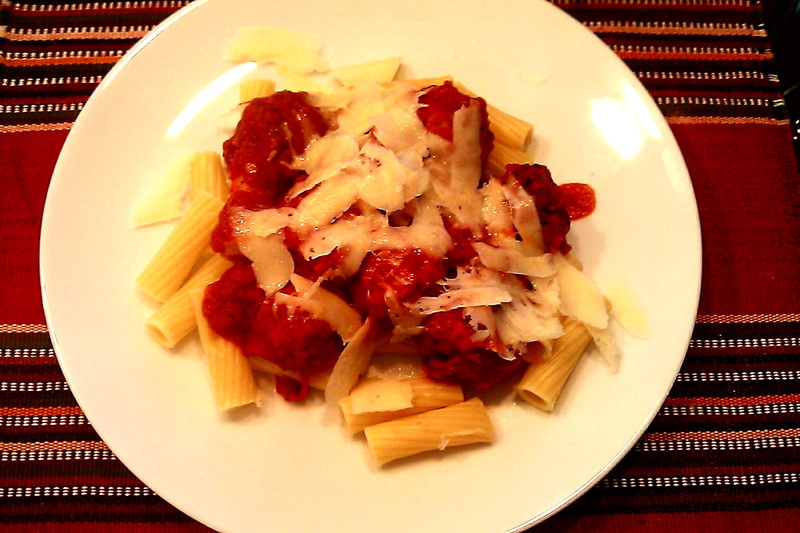 Serve pasta onto a plate and top with meatballs, warmed pasta sauce and shaved Parmesan cheese. I love meatballs!!! Although I have never tried using cilantro in it. Must give this a try. Thanks for sharing this with us. Oh those do sound good. I’ve never used cilantro very much but just last night my daughter asked me if I’d start some for her from seed – she loves it in summer dishes. I guess I’m going to have to look into this. I can usually buy 3 cilantro bundles (about 6 ounces) for $1.00 at the local Mexican market. Trader Joes sells 0.75 oz for $1.79. So I usually have cilantro left over. I find cilantro is a refreshing substitute to parsley in many foods. Oh that’s very cheap. Have you ever tried freezing it? I just gave Niki a couple pots of basil to take home which then of course brought up cilantro. I saw a very cute idea (don’t now how practical it is) but I saw on Pinterest where someone took fresh herbs & froze them in those mini ice cube trays in olive oil. I thought it sounded like a good idea since I usually use some kind of oil w/herbs anyway. No, I’ve never tried freezing herbs. I don’t freeze much food to begin with. But I’ve seen those frozen ice cubes with fruit pieces. What would you do with your frozen herbs? I was thinking they’d probably taste better than the ones in the bottles & I usually end up throwing away a lot of fresh ones because I don’t use them up fast enough. I could see melting the little cubes w/the herbs already in them instead of just plain oil & adding the dried herbs. Could be more effort than it’s worth but I think I might try it just to see if they taste fresher than the bottled ones. I never would have thought of putting cilantro in meatballs. Thank you for sharing your recipe. With all the spices, they look delicious! Thank you, Shari! I plan on making these again they were delicious.